Leaving your house keys behind, hopping on a plane and flying to an exciting destination is a thought that's surely crossed everyone's mind at least once. What everyone might not have considered is just how possible this dream may actually be. It doesn't take a crazy amount of money, just plenty of effort and planning. And you need to know where to start - that's where we come in. We've reached out to fellow travel writers and travellers to help us write a piece about preparing for a round the world trip. The first step is to take out a notebook and a pen and open your internet browser. If you have a travel guide book, even better. Now, write down all the continents you want to visit. Under each continent, write down the countries you want to see and under the countries, list the various cities. Once that's done, write down what you want to do in each of those cities. Safari in Africa? Scuba diving in the Great Barrier Reef? Hiking the Inca Trail in Machu Picchu? Jot it all down. After deciding what places you want to visit, cut this down by a third. Doing too much will cost too much and you'll end up running from place to place without even getting a chance to enjoy the sites. Once you have an idea of where you want to go and what you want to do, it's time to do some research. Using the internet or your travel guide book, start planning where your journey will start, where it will go and where it will end. It needs to make geographical sense. Visiting India, jetting off to Greece and then exploring Thailand doesn't make much sense at all as you'll be travelling back and forth. Once this is done you have to start eliminating and adjusting. Some places you may not be able to go to because it will be in the middle of a tropical storm or completely out of your price range or the visa requirements to enter the country might take up far more time than you have. Eventually, you'll have a lot of notes, ticks and lines on your list, but at least you'll know where you're going. It's always good to check travel blogs and websites to see what the best places are to visit and when to head there. Establish a time frame. If you want to visit 60 cities, you can't plan a trip that will last only a couple of weeks. At the same time, visiting three cities in one year seems like a bit of a waste for a round-the-world trip. Not all of us have the luxury of taking a year sabbatical, some of us may have to quit our jobs. The ideal time for a trip round the world is around one year but it can be done - and thoroughly enjoyed - in six months. As we're from the UK, we have an easier time than many other nationalities when it comes to moving from country to country, but it still isn't always a walk in the park. Some countries have very strict visa and visitation rules. Russia, for example, requires you to have a sponsor before entering the country. The sponsor can be a travel agent, but the application and acceptance process is lengthy. A few weeks of planning is needed for this stage. Each country has their own visa requirements, so visit the respective embassy websites and start filling in the applications - the sooner the better. There's still a lot of debate around whether buying a Round The World Ticket is cheaper and easier or if buying your own individual tickets would work better. Let's way up the pros and cons. With a Round The World Ticket you don't have a lot of control on where you want to go or how long you want to stay. If you decide to stay in one place a little longer and wave goodbye to your flight, your airline may just cancel all subsequent flights or you'll have to pay a hefty fee. If you arrange your own flights you can be a bit more flexible about where you want to go and how long you want to stay. The way I see it, the best way to do it is to book all the major flights (from continent to continent) before you leave but leave the smaller flights until you're in the country. You'll have time to decide when you want to leave and booking flights at the last minute can be a lot cheaper. The recommended stay in any city is three days. Remember, you're not there to spend your time sleeping (unless of course you have made plans to rest and relax). Three days is more than enough time to explore and tour. To save money and explore a little bit more, remember that you don't have to fly everywhere. Driving from different cities can be a lot more fun and gives you the chance to explore more of the country along the way. Or hopping aboard a ship that takes you around the coast is a memorable experience too. Granted though, this will take longer than flying so if you choose this route be sure to add a few more days to your trip. You may think you're invincible now, but bad food will bring even the strongest individuals to their knees. Your body isn't used to food in different countries and just because the locals eat it, doesn't mean you can too. Of course, trying out different meals is all part of the experience, so if you're feeling adventurous then by all means, go ahead. But at least try and understand or take note of what you're eating and make sure that it has been properly cooked. 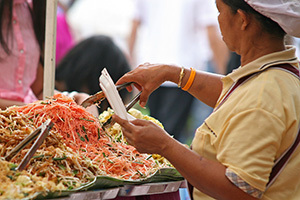 In some countries, street food is better than restaurant food and you're able to watch the cooking process. You might be afraid of a needles, but it's nothing compared to what you'll go through if you get seriously ill on your travels. Vaccinations vary depending on where you're going, but standard travelling vaccinations include Hepatitis A, B and C, Measles, Tetanus, Polio, Typhoid and Rabies. Some countries require a Certificate of Vaccination or Prophylaxis (ICVP) before you enter. There are various websites providing information about which vaccines to get for different countries. There's often confusion about what exactly Travel Insurance entails. Some insurance companies like Essential Travel Insurance , for example, offer emergency medical cover, flight cancellation, money and passport cover and baggage and possessions cover. Having insurance on your holiday is vital. You may not use it, but if you're in an accident or your baggage is stolen, not being covered can mean having to cancel your trip and return home and even doing that will take time, effort, money and of course, a passport. Now that you've made your plans and booked your tickets, it's time for D-Day. It's easy to think that you'll need your whole wardrobe since you're going to be away from home for a long time - but that's just not possible. In fact, it's best if you just have one bag (yes ladies, ONE bag). We actually only need a few essential items - all in threes. 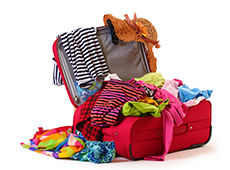 So three pairs of long pants, three t-shirts, three dresses... For more information about exactly what to pack and the handy electronics to bring along (a universal adapter and ebook, among them) have a look at various websites. Just when you thought it was all organised and done, you realise that you still have bills to pay or a flat and car to care for. Avoid this panic by planning what will happen well in advance. If you're renting a flat, it's best to start travelling once the lease has ended. If you own a place - put it up for rent before you leave and you will be getting a steady monthly cash flow while you're away. If you still have monthly bills to pay then arrange for them to be automatically debited from your account, saving you the hassle of having to make payment arrangements each month. Alternatively, you can ask someone to pay your bills while you're away. Let your bank know that you'll be travelling. If they notice strange activity in your account from abroad, they may freeze it. And make sure to have a Visa or Mastercard - they're internationally recognised, making it the easiest way to get cash almost anywhere in the world. Every other way is a lot more expensive and possibly unreliable. And just to be safe, keep some cash on you for emergencies.